Fox swivels are manufactured with a dark, matt coating which makes them ideal for use in clear, shallow water when targeting wary carp. Each swivel is produced to the highest standard, featuring barrels that rotate smoothly under tension and perfectly formed eyes. 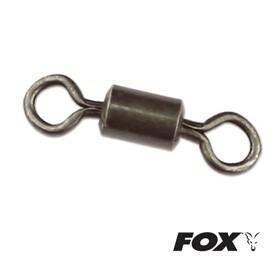 Size 7 swivels are designed to fit Fox rig components such as Carp Safety Lead Clips, Carp Safety Sleeves, Flexi Beads and our range of In-Line leads. The smaller size 10 and 11 swivels are ideal for use on presentations which require slightly more finesse such as light lead rigs and floater fishing set ups.